Sushi fanatics are unlikely to be found in one of the chaotic restaurants along sushi row in the Annex but many will worship at the costly bar of Kaji . As news trickled down that Kaji-san had branched out to the back of a cafe serving French-influenced Japanese pastries, the fanatic lifestyle suddenly seemed much more affordable. 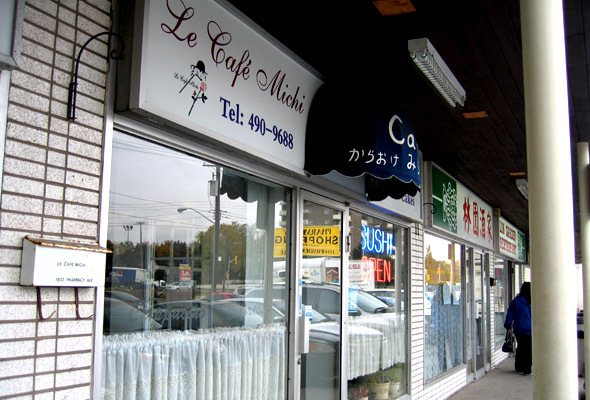 Rave reviews weren't enough to keep him around and the tranquil back room of Le Cafe Michi was taken over by Toshi-san. Curious to see if quality could still be found, we ventured for a relaxed lunch one afternoon. Le Cafe Michi is a curious place with cakes arranged at the counter and a small display of beaded jewelry right beside it. The entrance to the sushi bar is marked with a blue awning along the back wall but the waitress seats us in the front area where other patrons are having tea service. After several pages of pastries, we reach the sushi menu and choose a chirashi meal that includes salad, tea or coffee, and a slice of cake ($22). We opt for the green tea and refills are constantly offered throughout the meal. The salad reaches the table in record time and doesn't do much to entice. 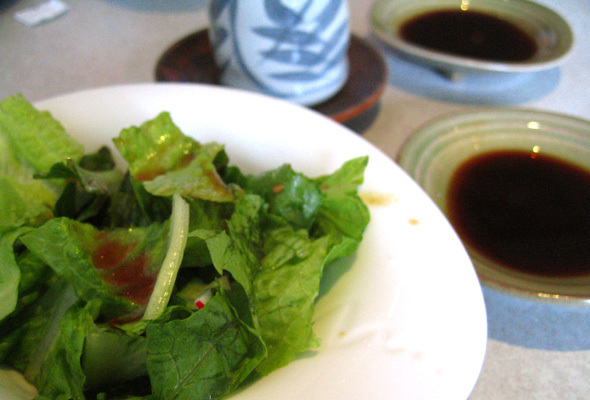 Chopped bits of romaine fill the fair sized bowl and a thin vinegary dressing barely graces the leaves. Although it starts lackluster, it is deceivingly good and improves with each bite due to the ponzu spiked dressing. Our chirashis arrive a short while after and are presented beautifully in three connecting bowls. 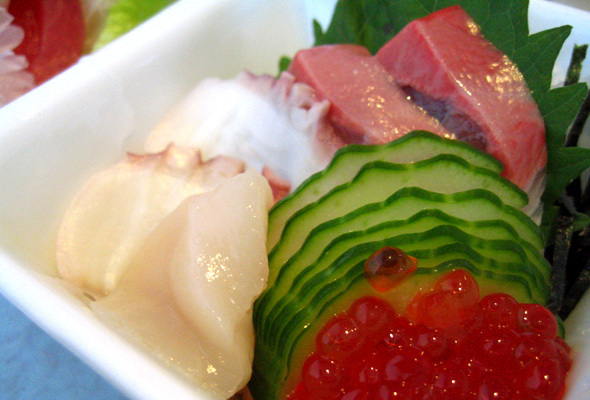 Fresh slices of glistening tamago (egg omlette), ika (squid), sake (salmon), maguro (tuna), tai (red snapper), ebi (shrimp), kampachi (premium yellowtail), hotategai (scallop), tako (octupus)and ikura (salmon roe) are arranged artfully with a shiso leaf and thinly sliced fans of cucumber. The more common pieces of fish are somewhat bland in flavour but the pricier items are wonderful. Ika is firm with a slight crunch, kampachi is tender and has a rich complexity, hotategai has a nice fleshy texture and sweetness, and the ikura has a cleaner taste from being soaked in mirin that balances the oiliness of roe. 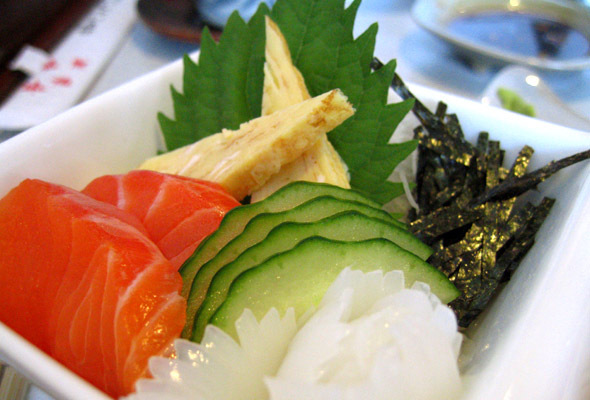 The sushi rice beneath is simple and not seasoned very much but does have the perfect texture. We leisurely finish our meal over conversation and as the dishes are cleared we are asked to pick a slice of cake from the display case. Several cakes are available to choose from and while the method is French influenced, the fanciful combinations are purely Japanese in spirit. The tiramisu cake is very creamy but lacks any espresso hints. 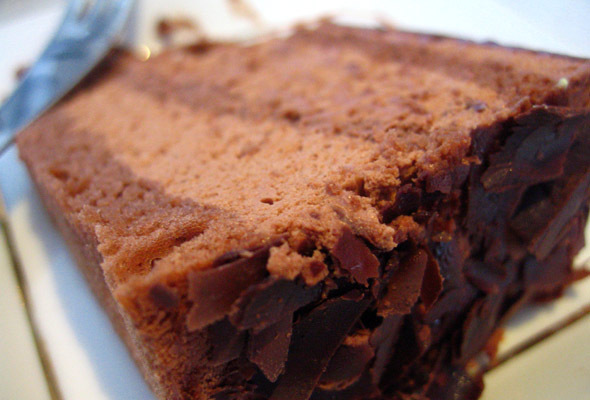 It is the chocolate sake mousse cake that wins over the table with its airiness, nice chocolate flavour, and zing of sake that goes straight to your brain. The service is very friendly throughout and the variety of delicious fish makes it very tempting to try their omakase ($45) on another visit. Toshi has picked up right where Kaji left off and his own following of fanatics are sure to come.